Great savings on hardware and software purchase, energy consumption, extra space, etc. are surely very desirable things for companies of any size. 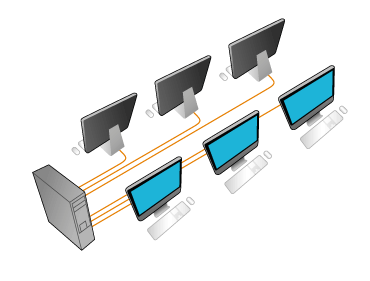 Would you like to know how to share a computer between several users for them to work independently and simultaneously? IBIK company is here to provide you with ASTER share a PC software that allows absolutely independent work for two and more users on one computer enjoying the equal computer resources! Our share a PC software ASTER is the new invention in the field of computer technologies designed to meet all your computing requirements while saving your budget and office space. From now onwards in order to support two users on one computer with the equal computing functionality just an additional monitor, keyboard and mouse are required. While users share one PC they can surf different websites, run different programs, write documents, even play games and more at the same time absolutely independently on their personal workplaces. Easy access to common shared devices like a printer or scanner is also equally possible for two users on one computer. There is hardly any need to use thin clients and terminal stations anymore as our high-end share a PC software ASTER is widely and successfully used in schools, universities, libraries, computer laboratories, accounting departments, offices, Internet cafes and other environments where the ability to share a computer between several users is extremely useful. With this program supporting two users working on one computer you can have an extra space, enjoy low noise level and significantly cut expenses on additional hardware and software purchase.